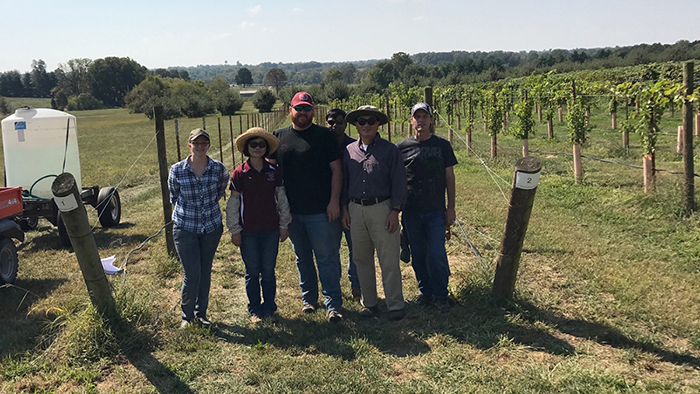 Dr. Chin-Feng Hwang (second from right) and his research team members at Missouri State Fruit Experiment Station in Mountain Grove. It’s a win for molecular grape breeding. New funding has been approved for a research project that uses genomic technology to create better varieties of grapes faster. The VitisGen2 project led by Cornell University, is a collaboration of 25 scientists from 11 different institutions, including Missouri State University. They are working in multidisciplinary teams to create new grape varieties that are more flavorful and sustainable. The project recently received $6.5 million grant for four years from the U.S. Department of Agriculture’s National Institute of Food and Agriculture, Specialty Crop Research Initiative. “Our team of researchers is the only one in Missouri working together with other teams across the country to expedite the breeding process of grapes, whose breeding cycle takes between five to eight years,” said Dr. Chin-Feng Hwang, MSU professor of agriculture. The project is based on a model that addresses the whole grape continuum. Overall, the goal is to develop high quality grapes at a lower cost and grapes that adapt easily to a range of geographic regions and climates, all with less environmental impact. This work can potentially save millions of dollars a year for the U.S. grape industry, noted Dr. Bruce Reisch, the project’s co-lead and professor of grapevine breeding and genetics at Cornell. Moving forward, VitisGen2 teams will focus on expanding the use of high-throughput DNA and plant evaluation technology to improve the quality of wine, raisin and table grapes, as well as rootstocks. They will also identify ways to maximize their collective knowledge of genetics to help growers manage current vineyards more effectively. To get updates about the project, visit the VitisGen website.